Business in the front, engine in the rear. We know you’re serious about your lawn; we are too. This year we've compiled Top-10 lists of the best-selling, top-rated and expert-recommended rear-engine riding mowers. 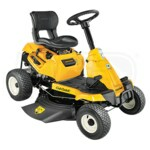 Best Rear Engine Riding Mowers - View Our Top-Rated & Best-Selling Rear Engine Riding Mowers. Our lawn mower how-to library can help you pick the perfect reel lawn mower, push lawn mower, riding lawn mower, zero turn lawn mower, lawn tool or lawn mower accessory.